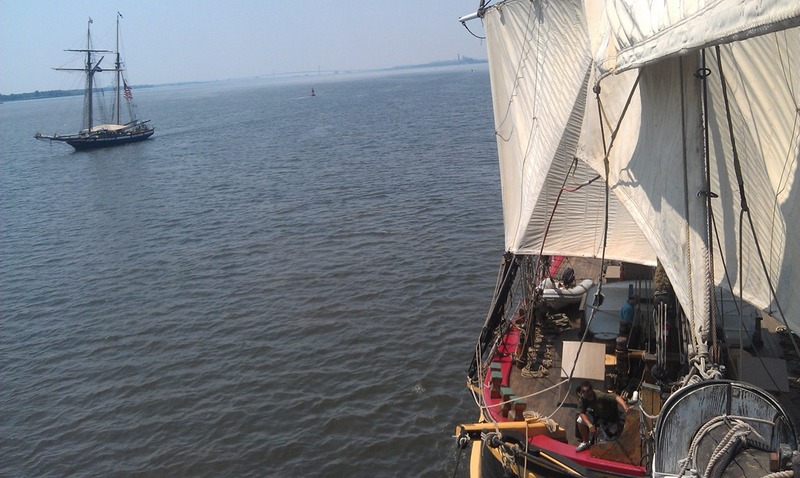 For our final leg up the Delaware River HMS Bounty sailed side-by-side with privateer Lynx. We were astonished by the strength of the current in the Delaware River and the amount of debris in the water. Many large chunks of wood and even a 30 ft tree! 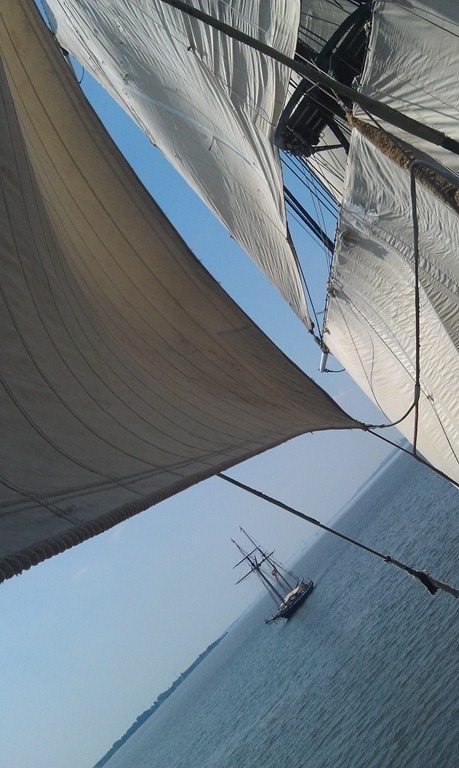 It has been pushing 100 degrees the last few days with little to no wind, but we came in under full sail for the city of Philadelphia. It took the crew just 20 minutes to set every sail on the ship, quite a feat in the hot weather!! Although we were motoring in the calm conditions, those towers of white canvas were, as always, a wonderful sight to see. After all the sails are set the work is not over, later when they are struck all crew must go aloft to furl them back up on to the yards. (Much more work than our sloop Velocir!!!!). It is exhausting for us to keep up with the crew. Hands become calloused and muscles ache. But after a few weeks you become astonished at your own strength! One of the best parts of being on the ship is climbing all over it. 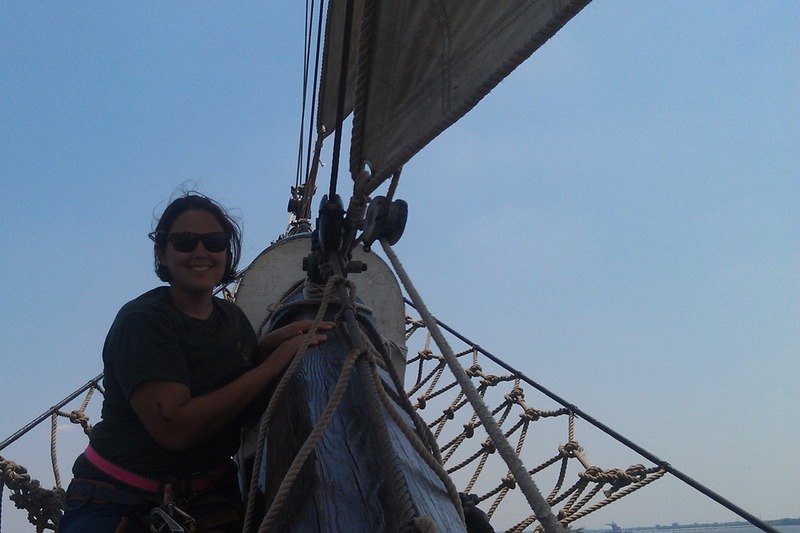 Out to bowsprit, up the masts (three to choose from) and down into the depths of the ship. Amelia’s favorite spot is the bowsprit. It juts up and gives a beautiful view of Bounty cutting through the water. Amelia and Grant took the night watch of the ship last night so the crew could sing their chanties and drink their beer with the other tallship crew. While Grant was below pumping bilges (wooden boats…) he felt the boat suddenly heel 15 degrees….at the dock! Amelia was on deck saving the flags before the thunderstorm/squall came upon us blowing gale force and causing a complete whiteout. The crew stopped hanging the disco ball in the tween decks and burst from the ship clad in foul weather gear to rescue a tent on the dock that had exploded and then everyone jumped to repositioning dock lines and gear in the pouring rain after the wind had subsided.